Established in the year 1985, "PVC Colouring Compounding and Processing" is one of the leading manufacturers, exporters and suppliers of a wide range of PVC compounds such as PVC compounds for hoses, PVC compounds for moulding, PVC compounds for bottles, PVC compounds for medical applications etc., for diverse industrial applications. These are available in various hardness, colors and specifications as per the client’s requirements. 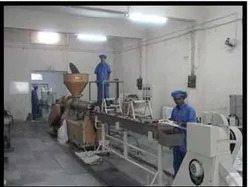 We have been getting strategic advantages over our competitors due to our advanced manufacturing facilities. Our whole manufacturing unit is well equipped with the latest machines that allow us in accelerating the rate of our production. To keep a sturdy resemblance between our business aptitudes, we sincerely follow a consolidated form of quality control through out the entire production process. 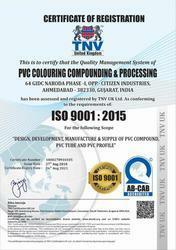 Owing to this we are appreciated by our esteemed clients that are spread across the world. Moreover, guidance of our mentor, Mr. Girish Perkar has played an important role in promoting the name of our organization in the wide competitive market. Presently, we are known as a prominent choice of our valued clients only because of his supervision.We export our products in Indian Subcontinent. Besides, for promoting the name of our organization in the wide competitive market, we follow a strategy in two fold. This plan includes strengthening of our management in all our activities, by regularly increasing their competitiveness and capability to innovate. 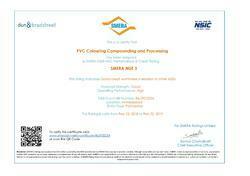 Manufacturing, Trading, Importer and Exporter of PVC Products and Compounds. We are engaged in manufacturing,exporting & supplying a wide range of PVC compounds as per the requirements of our esteemed clients. Our range includes PVC Compounds for medical/food grade, PVC Compounds for wires & cables, general purpose, PVC Compounds for building & construction, PVC Compounds for automotives, PVC Compounds for footwear, PVC Compounds for pipe, hoses and tubing, PVC Compounds films & sheets, PVC Compounds for moulding and PVC Compounds for bottles. We have a support of experienced and devoted team for manufacturing various kinds of PVC compound such as PVC compounds for hoses, PVC compounds for moulding, PVC compounds for bottles, PVC compounds for medical applications, master batches and allied products as per the client’s requirements. 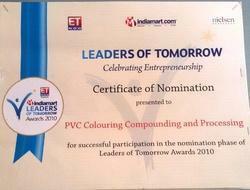 Their hard work and complete efforts have taken our organization to new heights. We have appointed a team of the following dedicated engineers, technicians, quality controllers, marketing representatives, warehouse in charges, research analysts and packaging experts, who always try to promote the name of our organization. Our team of quality controllers is engaged in checking the quality of our input so that an excellent output is offered to our valued clients. Research analysts are capable of understanding the requirement of the market so that we can offer our range accordingly. 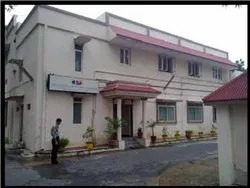 Our research analyst’s team is also geared to push PVCL into 21st century with an unmatched product line. 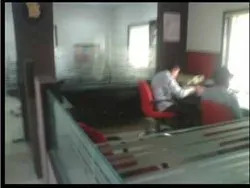 We also provide regular training to our team so that they can work as per the changing technology. Our team works under the supervision of our mentor, Mr. Girish Perkar, whose guidance helps us in carving a niche in the worldwide market. 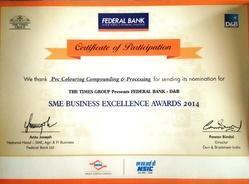 Certificate of Participation (SME Business Excellence). Enema nozzles for blood transfusion & dialysis kit etc. 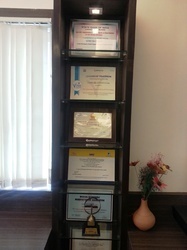 Some of the Awards and Recognitions.